Viewpoint Tickets - Best prices on Nationals tickets, MLB tickets and MLB All Star tickets. Location: About 7 kilometers (4.2 miles) from downtown Montreal. First base, Rue Faillon; right field, Boulevard St. Laurent and public swimming pool; left field, Rue Jarry; third base, Canadian Pacific Railroad tracks. Dimensions: Left field: 340 ft.; left-center: 368 ft.; center field: 415 ft. (1969), 417 ft. (1971), 420 ft. (1974); right-center: 368 ft.; right field: 340 ft.; backstop: 62 ft.
Montreal was granted Canada's first Major League Baseball franchise in 1968 with the proviso that the team find a suitable place to play, pending the eventual construction of a promised domed stadium. 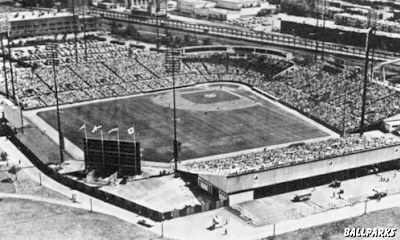 Jarry Park (Parc Jarry) Stadium was a 3,000 seat municipally owned ballpark located in a corner of Jarry Park. The city expanded the seating capacity to nearly 28,500 in time for the Expos' 1969 inaugural season and the team played there until they moved into Olympic Stadium in 1977. Jarry Park is still standing and is used regularly for social and civic events, professional tennis and other large outdoor gatherings. Aerial view of Jarry Park courtesy of Dennis Goldstein. View of right field scoreboard courtesy of the Franklin Digital Collection. View of grandstand by Munsey & Suppes.